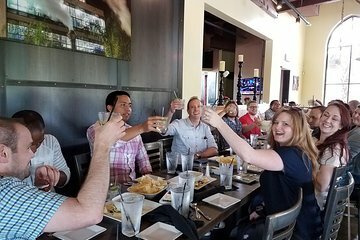 Proef de beste taco's en margaritas van Dallas tijdens deze tour van een halve dag. Leer meer over de geschiedenis van deze traditionele Tex-Mex-gerechten en -dranken in je gids en proef enkele van de beste van de stad. The tour was amazing and Rhonda, the tour guide, was even better! I highly recommend it! This tour was SO much fun! What a fabulous tour guide, so up beat and positive. We went to restaurants we would have never gone to or found. We have recommended it to everyone weve talked too. Thank you ! We had a great time on this tour! Our tour guide, Rhonda, was awesome. She was so funny and personable! The tacos and margaritas were delicious as well. Highly recommend this tour! It was a blast! This tour was amazing. Our tour guide, Rhonda from Dallas by Chocolate was phenomenal. She was so funny and made the experience that much better. Of course, the tacos and margaritas were delish! Must try! We had an amazing time! Tacos were amazing and our tour guide and group were so much fun! Definitely a must when in Dallas! From the start our Tour guide Rhonda was very welcoming and friendly the group was so much fun and the Margaritas great and all the spots we stopped for taco's were amazing. we have been living in Texas for over a year and this tour we finally found Cali style tacos. I would recommend this tour for a day of FUN AND GREAT TACO'S!! !